My crafter's ADD has been rearing it's ugly head lately & last night I pulled an all nighter. In the cold light of day, it's not so pretty. There's an awful lot of clean up to be done. And a lampshade to be replaced. 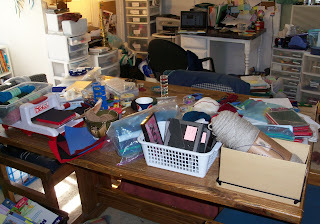 I did get lots of projects finished and even more started. There were fingerless gloves, lacy knitted bookmarks, a variety of beaded Christmas ornaments, a few framed Christmas pictures/sayings, and a few wine bottle decorations. When I uploaded that photo this morning, I discovered a few other pictures. I think the kids have been playing with my camera again. My favorite wind chimes. They are so tinkly! They are also loud enough that I can hear them from my office area, but they aren't so loud that they wake you up. They must also be pretty dang strong because they've survived several hurricanes. My failed attempt at growing basil in a coffee can on the porch. The plant was doing great for a few weeks then the summer heat got to it. Or perhaps it was my black thumb. And this lovely photo of me falling off the steps while trying to model/photograph a pair of fingerless gloves. As you can see, the basil was not the only failed attempt at growing things in pots. I can't even get mint to grow!